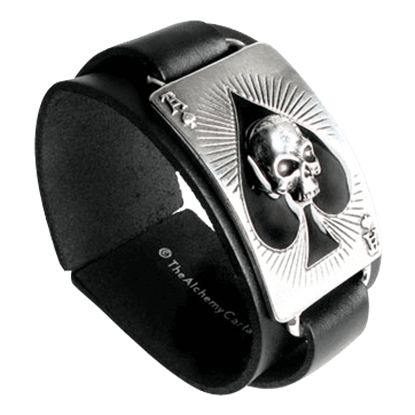 Many of our gothic bracelets are made of pewter or leather with pewter emblem. We carry many styles of gothic bracelets that include skull bracelets, bat bracelets, pentagram bracelets, and vampire bracelets. We also offer gothic bracelets in a variety of styles, including cuff bracelets, gothic bangles, and gothic wrist straps, so you are sure to find something that will suit your particular aesthetic. All of our bracelets are finely crafted out of high quality materials, and our pewter gothic bracelets are made in Sheffield, England by master craftsmen. A sumptuous bracelet with a romantic motif, the Bacchanal Rose Bracelet reveals a secret libertine passion for wine and sensual pleasures. 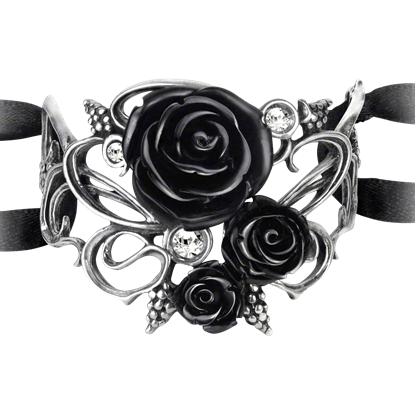 The three black acrylic roses and grape clusters represent a lavish dark love. A loyal companion offering the protection and guidance of Odin, the majestic raven glides swiftly with its wings outstretched. 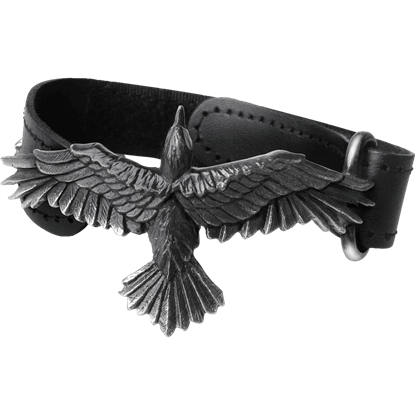 The Black Consort Wrist Strap displays the sculpted black raven on an adjustable, genuine leather bracelet. For a fierce look that is worthy of the darkness that resides within your soul, include the Black Interplate Chain Link Bracelet. This piece adds a rebellious touch to any look, lending an edge to gothic, biker, and rocker ensembles. 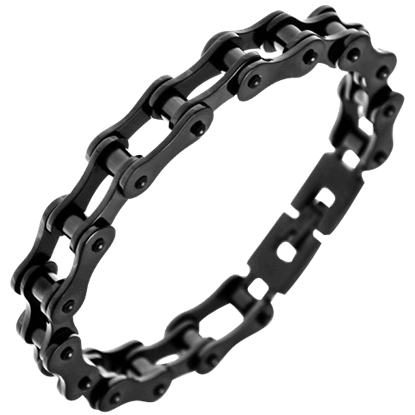 Create a look that is tough and fierce, one worthy of your dark soul, with the Black Slimline Chain Link Bracelet. 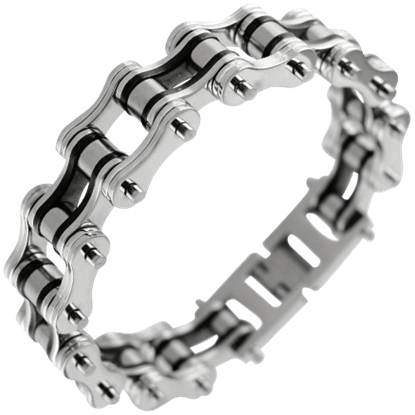 With no loss in style, this gothic jewelry is lighter and slimmer in design than the classic motorcycle chain bracelet. Many urban environments are associated with colors on the grayscale, which makes the gothic style go well with urban fashion. 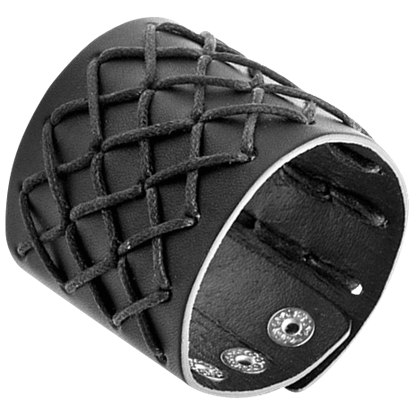 Fortunately, the Braided Cord Gothic Wrist Cuff, with its extra wide body, is ideal for both styles! The gothic and Viking styles align somewhat frequently, which is exactly what happened with the Braided Gothic Bracelet. 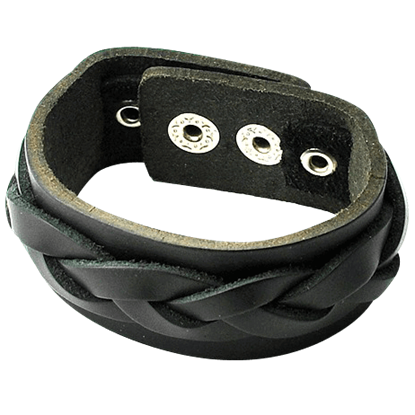 This leather bracelet exhibits the dark color of the gothic style, but is also a bit Viking in its design. 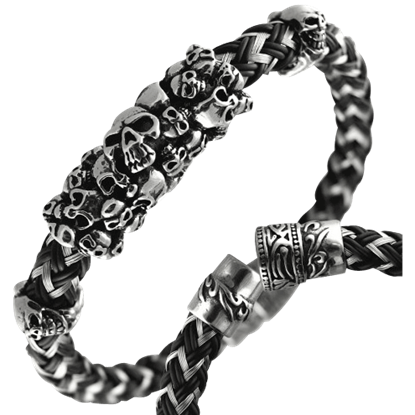 For a look full of raw power and dark edge, fasten the Braided Leather Skull Bracelet around your wrist. 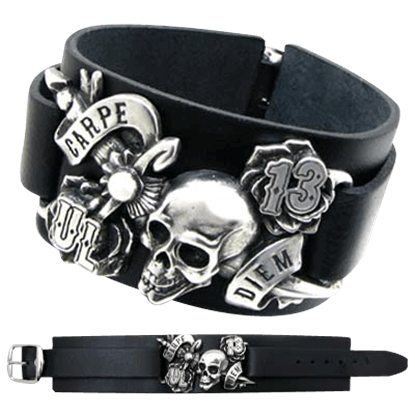 Grim and gritty in style, this bracelet adds an extra dose of fierceness and foreboding to gothic, biker, and punk rock outfits. Nothing inspires foreboding like the sight of a mass of skulls. A fascinating contrast between rubber and metal, the Braided Rubber and Wire Skull Bracelet has them in ready supply, making it the perfect accessory to gothic looks. If you want to add a leather wristband or bracelet to your gothic wardrobe, but you want something that will not be obtrusive, the Buckled Gothic Wrist Cuff is the way to go! It is very conservative in its double-banded style. 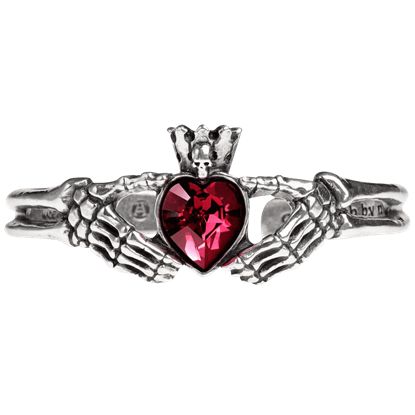 The claddagh ring has long been a symbol of love, friendship, and fidelity. The Claddagh By Night Bracelet adds an underworld twist, with skeletal hands grasping the crystal heart, and a skull peering from the crown atop the heart.